The Mountain Buggy Sleeping Bag 2017 allows your baby to be warm, comfortable and safe on the go. Simply attach the sleeping bag to your Mountain Buggy pushchair, strap baby in using the hassle-free front zip, and rest easy in the knowledge they'll be toasty on your travels. If you're looking for a way to keep your child cosy while out and about, without the need for packing blankets and duvets that can get caught up in the buckles, the Mountain Buggy Sleeping Bag is for you. Why should I choose the Mountain Buggy Sleeping Bag 2017? The Mountain Buggy Sleeping Bag 2017 offers warmth and comfort for baby, without compromising on safety and practicality. This sleeping bag connects to your Mountain Buggy pushchair using the existing safety harness and has a handy front zip, meaning you can lift your baby in and out of the pram with ease. 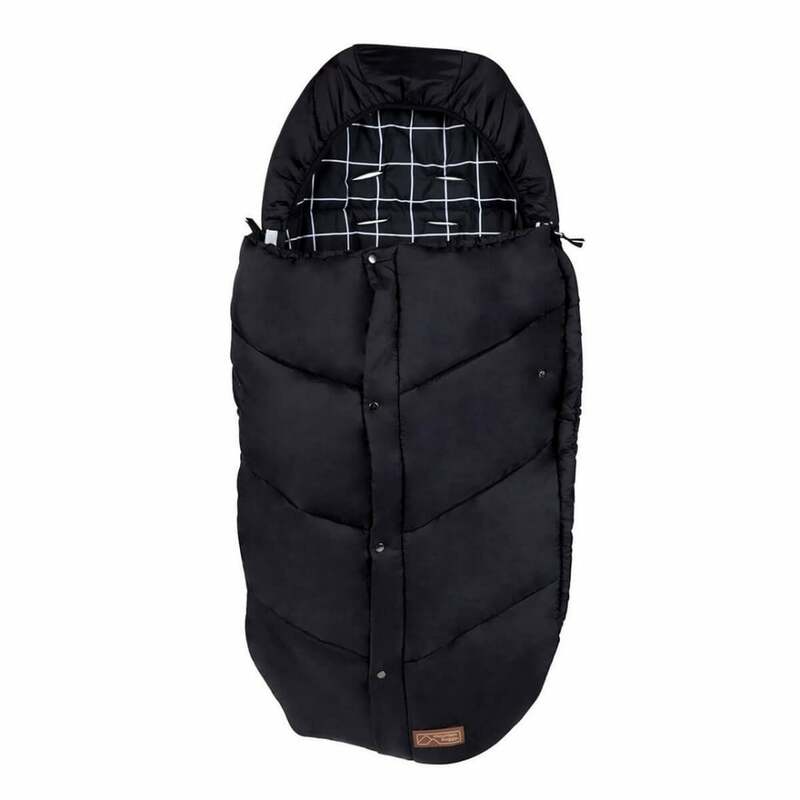 As well as a front zip, the Mountain Buggy Sleeping Bag also has an open-foot zip option so that baby can wriggle and kick about freely on those warmer days. Alternatively, the front panel can be removed to act as a simple liner for your Mountain Buggy pushchair. While this Sleeping Bag is super practical, with a durable rip-proof outer material, it doesn't lack in cosiness. The sleeping bag is lined with a super-soft brushed polyester and has an elastic hood so your child can be extra-snug. The Mountain Buggy Sleeping Bag 2017 comes in three bold colour sets, including a chic black grid option. *Please note that the harness holes on the sleeping bag 2017 differ slightly to the fabric sling of pre-2015 buggies. Overall harness length is therefore shortened by approximately 1" when used with earlier models. This is a minor adjustment and poses no safety risk. What are the specifications of the Mountain Buggy Sleeping Bag 2017? Do I get a warranty with the Mountain Buggy Sleeping Bag 2017? Showing our 2 Mountain Buggy Sleeping Bag 2017 reviews with an average rating of Excellent. Would you like to write a review? Your Review - I purchased the sleep bag to go with our mountain buggy nano. I absolutely love the sleep bag. It’s so warm and snuggly. Little one loves it too. It’s well made and for the price a great item. The only downside I found was needing to take it off the nano every time I needed to pop it bag in the car boot. But that’s a small problem. Your Review - The sleeping bag appears to be well made, we are currently using it in the parent facing bit of the carry cot and it is easily big enough to be used long term in the buggy also. The only down sides we have found are the straps can feed themselves back through the slots in the bag and effectively shorten the straps, this isn't a bit problem once you're aware. It's not cheap but is likely going to last a long time so should balance out.